In The People's Economics I argue that as an economic system tends towards equilibrium it should also tend towards a more egalitarian society. The great inequalities in our society indicate to me that the economy is somehow prevented from moving towards the optimal position. So I'm hoping that Inadequate Equilibria will shed some light on this, and maybe indicate how we might deal with it. I've know of Yudkowsky's work in AI, and have read some of his seemingly endless Harry Potter and the Methods of Rationality. 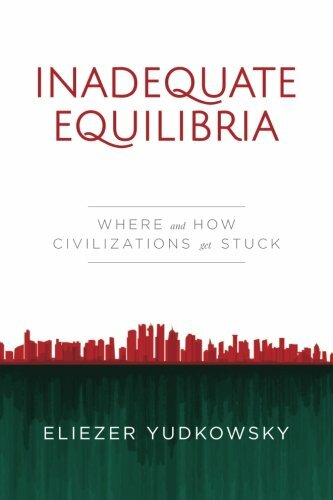 Inadequate Equilibria is much shorter, so it should be much easier to finish reading. The blurb presents this book for the reader to exploit inefficiencies in our economy rather than fix them, but I guess that's OK since if people exploit them then Adam Smith's invisible hand will fix them. The question is, can you actually exploit inefficiencies. Yudkowsky gives stock prices as an example of an efficient market, but I'm not so sure. Keynes thought that stock prices were governed by what he called a Beauty Contest, in which people pricing shares on what they think everyone else thinks their value is. But the market can stay irrational longer than you can stay solvent, so you can't benefit from this irrationality. The monetary policy of Japan is mentioned as an inefficiency which there is no way to exploit, but again I feel that while there may be no simple way to exploit it via the financial markets, there may be a more difficult (and probably risky) way to exploit it. Yudkowsky then tells of how he tackled his wife's seasonal affective disorder by putting up 130 LED light bulbs. Surely though the medical establishment should already have thought of that? I'm not so sure. In Steven Pinker's The Better Angels of Our Nature he describes how the cost of lighting has plummeted. Until a few years ago that amount of light would have been prohibitively expensive, so it's hardly surprising that no one tried it to treat SAD. So I'm not convinced about Yudkowsky's arguments so far, but it's entertaining reading, so I'll see what he has to say in the rest of the book. Yudkowsky discusses the failure of the FDA to approve Omegaven for intravenous feeding of babies, and how this has led to hundreds of deaths. He doesn't really go the the root of the problem, which is that once parents hear about Omegaven, they aren't willing to enter a controlled trial where their child may get the inferior alternative. Why aren't people making a fuss about all those dead babies? Probably for much the same reason that they don't jump for joy at the way infant mortality has plummeted over the last couple of centuries. 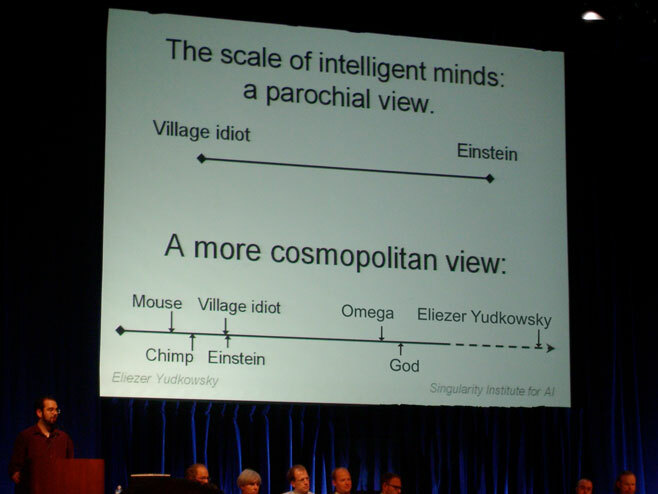 The discussion seems to be a defense of his point of view. The trouble is that it seems to be of limited applicability. Yes, if the cost of failure is small you shouldn't worry that a task will be too hard for you. But the cost of failure often isn't small. For instance if you go for a challenging degree, but end up with large debts and a mediocre result then you might think you should have chosen a different way to spend 4 years of your life. One would also think that Yudkowsky's argument against excess modesty would mean that the book has a can-do feel, but I actually found it somewhat defeatist. In an efficient market you can't improve things because someone else will have got there first. In an inadequate system you can't improve things because of the inadequacy of the system. Yudkowsky also says that you should be willing to enter into bets on what you believe to help with your learning. But an important part of betting is that you're not supposed to try to influence the result. Everything seems to point to reasons for inaction. My feeling is that if you think you can do something new in 20 hours then someone's probably already tried it - lots of people have that amount to spare. If you think you can do something in 8000 hours (I think in powers of 20), well maybe you can, but you need to think about how you will support yourself for that amount of time, and whether it is worth the risk. You will almost certainly need help from elsewhere, which means working with an inadequate system. But a task that takes 400 hours, well that might just be possible, and may well lead to something new. One thing I will say about this book is that it is very thought-provoking. While I was reviewing it I found myself constantly getting distracted by following up an idea it suggested to me. That may be a warning against thinking that it will be a quick read, but it may mean that reading it ends up being highly worthwhile.